The illicit flow of money out of Africa is at least double what the continent receives from development assistance, according to conservative estimates. 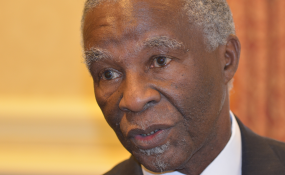 Large corporations are responsible for most of the losses, although government theft does play some role, according to Thabo Mbeki, the former South Africa president who is heading the High-level Panel on Illicit Financial Flows from Africa, created by the UN Economic Commission for Africa and the African Union. Money leaves Africa through tax evasion, money laundering, cross-border smuggling and corruption. Here's a proposition: Africa is a poor continent and developed nations provide massive support, including through development assistance. What's wrong with that portrayal? It's true that the majority on the continent is poor. But it's also true that the continent is losing a lot of its own resources, domestic resources, which - because they leave the continent - perpetrates that poverty. I'm sure you remember that part of the argument about debt forgiveness has been exactly this - that indeed the continent might get all these loans, but in terms of servicing the debt, the continent ends up being a net exporter of capital. So what was given as assistance to help us to address poverty ends up assisting other people - the ones who are supposed to be assisting us. With regards to our panel specifically, it was decided that we should look at illegal, illicit export of capital from the continent, because this was taking away resources which belong to the continent. Therefore it was necessary to look at this to see how to stop it. The continent is losing an estimated U.S. $50 billion a year through illicit capital outflows. This amount of money is larger in volume than the assistance the continent receives annually. We are losing more than we are gaining, and therefore it is really critically important that the matter be attended to, so that we retain domestic resources to address the poverty challenges and development challenges that the continent faces. The widespread perception is that governments are among those mainly responsible for the illegal activity? That's not the reality. The main culprits are international corporations. There is money that leaves the continent as a result of theft by Africans, whether by government or private sector people. But the bulk of the funds that flow out of the continent is taken by big corporations. This poses a particular challenge, because they have got capacities which African countries don't have - capacities to employ the best lawyers in the world, the best accountants in the world. They know the ropes. For that reason, it's important that when the panel makes proposals, they are practicable, implementable and can produce the desired outcomes. This therefore also means that we've got to address capacity, the capacity to intervene and defeat the practices in which powerful institutions are participating. When this capital leaves the continent, where does it go? It has to go somewhere. And clearly it goes to developed countries [and] it goes to tax havens, so we've got to find a way of addressing the destinations for this money. That's why we are in the United States - to understand what the United States itself is doing and is willing to do to help the African continent address this challenge. Clearly some of the corporations involved are U.S. corporations, but also a destination of these outflows would be to developed countries like the United States. What kind of concrete steps do you think need to be taken? Our first step is to engage exactly these institutions. We are engaging the U.S. government, as I said. We are going to be engaging the OECD, the European Union, and some of the countries that are members of the G8, the G20. We have to find a way by which what the African continent seeks to do as the originator of these outflows is then reciprocated by what recipient countries do. Hopefully, by the time we produce this report with the practical steps that need to be taken, it should be possible to take on board as implementing agencies for those proposals not only the African governments but governments in the developed world and institutions like the World Bank, the IMF. That's why we are interacting with all of them. Given the response I've received on the continent and outside of the continent, it does seem that there is a common determination to address this matter. There was an interesting remark from civil society people we met here who were saying that this intervention to deal with the illicit capital outflows from Africa might indeed be timely. Developed countries are talking about donor fatigue, so they might find it preferable that the continent retains the resources it has rather than being under an obligation to increase overseas development assistance. I hope that's not the outcome, because I am not saying that additional resources that would come via ODA must dry up because of this. But it could be well-timed. Do you consider illicit flows to be a crisis? It's clearly a very important challenge for us. The $50 billion that I'm talking about, these figures are only estimates based on published figures by the World Bank and the IMF. Most likely it is a bigger problem than what we are able to estimate in terms of statistical information that's available. Poverty is a crisis. We face a major challenge on the continent: the challenge of economic development. We know the interconnections between poverty and underdevelopment and the issues of peace and security and social cohesion. What our work is about is changing the lives of Africans for the better. That is why we need resources to invest in health and infrastructure and education and so on. It is encouraging that people on the continent and outside of the continent understand that this challenge must be addressed.